Concert Ticket Pre-Sale for Season Pass Holders!! Tickets for our Subaru Summer Concert Series are now available for purchase! General admission tickets (for non-Season Pass holders) are $12.00 each, and now available to purchase at any quantity for any specific concert. 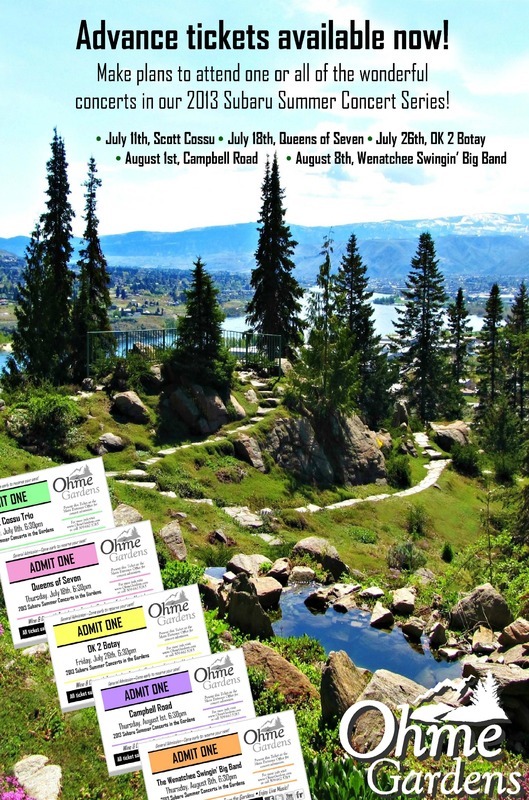 If you are an Ohme Gardens Season Pass holder, tickets are now available in bulk (increments of 5) at $6.00 a ticket! These tickets are transferable, you can use them for any concert you would like and give them to whomever you choose! Purchase 10, 15, 20 tickets, all at 50% off the General Admission Price. If you are a Season Pass holder and would not like to buy in bulk, admission is $9.00 per ticket (this is the same price you would pay at the door). We have a fantastic lineup this year, and are so excited to bring such talented artists to the Gardens. Questions? Call the Ohme Gardens office at 509.662.5785. Our office is open from 9:00am to 7:00pm, 7 days a week! This entry was posted in Garden Events, Summer Concert Series and tagged Concert Series, Events, Music, Sale by ohmegardens. Bookmark the permalink. Last day to visit the Gardens!